This “fieldstone” fireplace is constructed in a private trail-side log vacation home. The majority of the stone –including two large pieces framing the main firebox–is a blend of Mica and Schist from a nearby quarry. The rest of the stones are weathered Quartzite boulders collected by hand from the homeowner’s stone walls. The large lintel stone is a hand-split slab of granite salvaged from an old foundation. Brown Masonry craftsmen used a chain lift suspended from the log trusses to hoist the stones into places, beginning with large 6-10-ft slabs. A gas-fired pizza oven with a 4-in. thick Vermont Soapstone hearth faces the kitchen side of the chimney mass. Brick for the oven are century-old hand-pressed pieces salvaged from an 1800’s farmhouse. Greb Brown and the homeowner designed the fireplace. 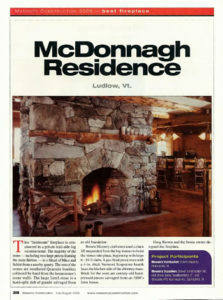 From the July/August 2006 issue of Masonry Construction.